Are you an aspiring actor looking to hit it big in the industry? Check out any of these acting classes in NY, and get the training you'll need to get the big roles in Hollywood. 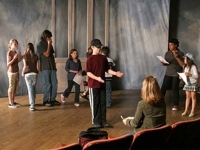 We have listed all types of drama classes in NY, so you can deliver the greatest performances on stage or on screen. Scroll through our guide to drama lessons in New York and find out which one best suits your needs. Find all sorts of improv classes in NY, and learn everything from short-form to long-form improvisation. Get improv lessons in New York from some of the most talented professionals in the field! Select from a wide range of musical theatre classes in NY, and find out which one best fits your musical and theatrical needs. Learn to sing, dance, and act from some of the most talented professionals in the business!